FREE Bonus In the Hoop Goodie Bags - YAY! ** 4 Sizes of applique letters included (4x4 and 5x7 hoops) You receive both satin stitch, satin stitch deco option and fast stitching zig zag versions. 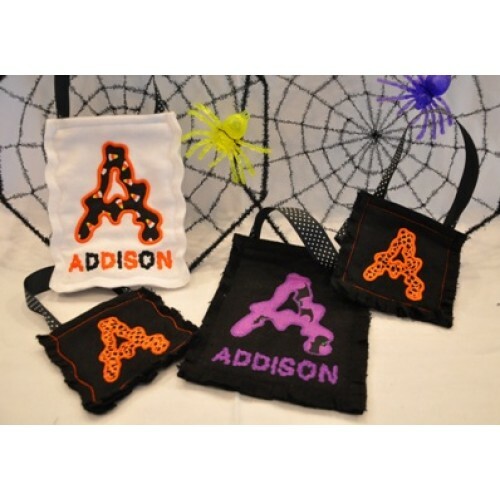 Super cute halloween font, perfect for shirts, bookbags, Goodie bags, wall hangings, etc. The bonus Goodie Bag files come in both 4x4 and 5x7 and feature both square and wave shapes. Designed to make the edges Raggy (or not), you decide how you want to make them! Instructions are included for both raggy and non raggy edges. 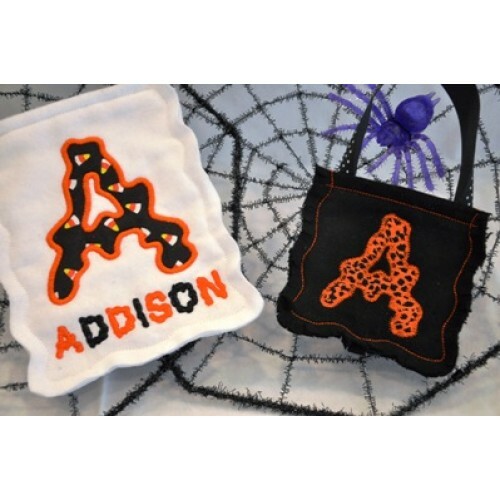 I've also embedded the Applique letters right into all of the goodie bag files - no fussing with software, unless you want to add the coordinating name as I did for Addison. Notice I made the white one without raggy edges and the black one with raggy edges - the choice is yours - instructions included. Here's the square versions, also designed to be raggy or not (I ragged both of these but it is sort of hard to see it because they are black). 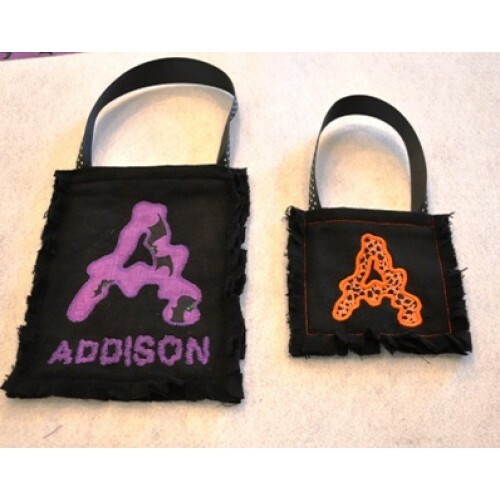 Did I mention the applique letters are embedded right into the Goodie Bag files? No fussing with software!!! (The goodie bag files come with complete instructions with lots of easy to follow how-to photos included (PDF). 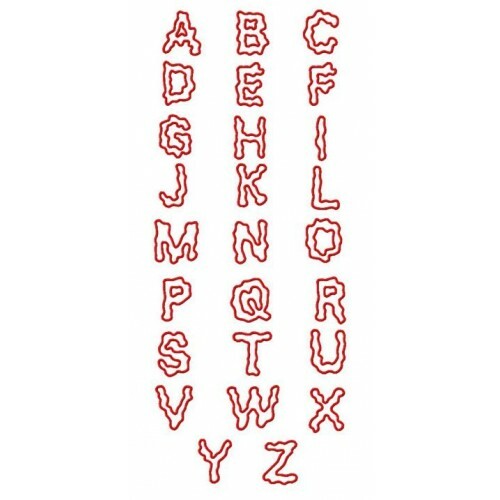 You also receive the complete font set which includes Applique Caps and matching lower case letters for creating stacked monogram names. 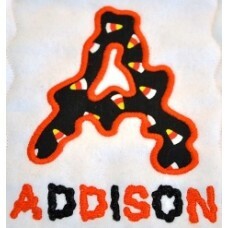 The 4 sizes of Applique letters include approximately 3 inches, 3.85 inches (4x4 hoop), 4.30 inches and 5 inches (5x7 hoop). Lower Case comes in 3 sizes which include approximately .75 inch, 1 inch and 1.25 inch heights. Here's a sample of them stitched out. Don't they stitch nice?